Mine: Dumb, really dumb. Jim Carry has a great gift for physical comedy, but it is wasted in a really dumb story. Leonard Maltin/Plot synopsis: Miami-based ``pet detective'' is hired to find the kidnapped mascot of the Dolphins football team. No-brainer comedy/whodunit was the breakout role for hyperkinetic, rubber-faced Carrey, who mugs non-stop (and we mean non-stop). 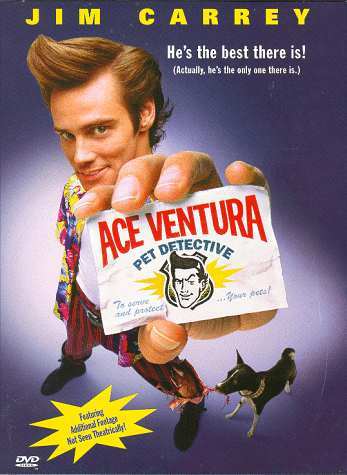 Some good gags, but runs out of steam--which Carrey never does. Real-life members of the Miami Dolphins appear, with quarterback Marino in featured role. A minute of new footage added for video. Followed by a sequel and an animated TV series. (out of 5 stars) Ok here's the deal. Finnaly Jim Carrey gets his big break. It's his best movie yet, it may not be that funny, but he's improving. One thing that could help Carrey is some medication, because he's crazy. The movie was Ok.
(out of 5 stars) I loved it!!!!!!!!! I loved Jim Carrey in it!!!!!!!!!!!!!!! It is a great movie.